Friendly display, clean and cute design, cat shape, Excellent gift in birthday or festivals, special designed for kids, teens, and senior ! Alarm starts loud driving you get children right away out of the bed. Super loud alarm stays in crazy bell till the alarm switch is turned off. Getting away from noise "ticking", Our bedroom alarm clock creates an absolutely quiet environment when you sleep, work and study. Manual-light illuminated dial glows evenly across the entire dial for night time viewing, soft, energy-saving. Only a few buttons, it's easy to set the time and alarm, even for kids. ⏰ A lovely shape with the large black Arabic numbers which well printed on the pink cardboard go of an awesome cute, looks conspicuous in your nightstand. it would fit any kid's bedroom, best gift for kids. ⏰ Super loud alarm good for heavy sleepers, no snooze button, good for girls who has trouble to waking up. 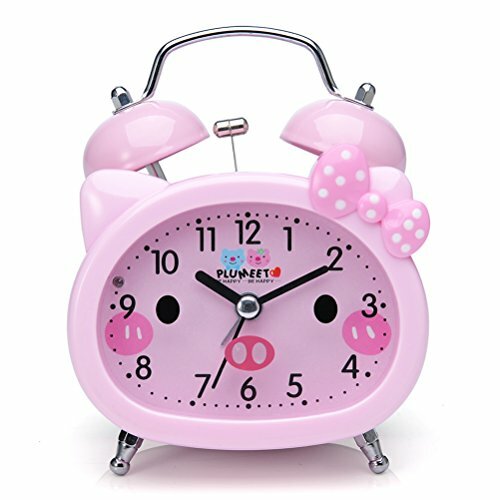 ⏰ Girls alarm clock precise quartz movements to guarantee accurate time, quiet sweep second hand ensure a good sleeping and work environment. ⏰ Easy to set the alarm and time on back of the clock, backlight buttons on the back which is simple to press, time will be clearly visible at night. ⏰ Battery operated and low-power quartz movement requires 1 AA battery - not included (a good battery can be used for more than one year). If you have any questions about this product by Plumeet, contact us by completing and submitting the form below. If you are looking for a specif part number, please include it with your message.